The internet is full of contouring tutorials and for a beginner, it can be a little overwhelming. It's difficult to find products that will do the job and finding ones to suit your skintone..even more difficult. 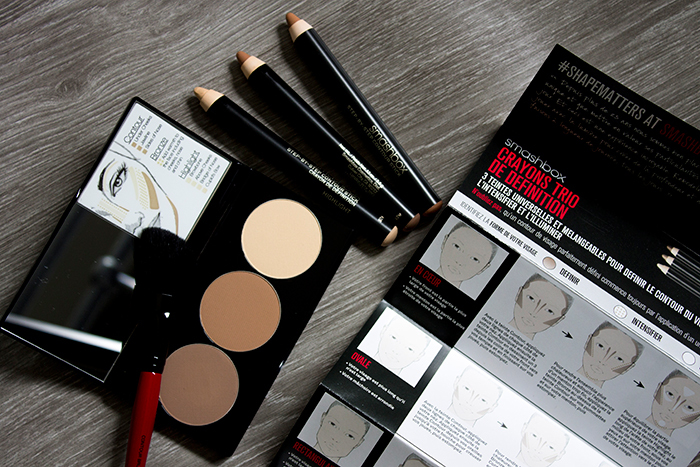 Smashbox have made it so much easier with their contour kits, from powder to stick form said to suit all skintones. Here's why you need them. The main contour images you see are the ones with cream/liquid based products drawn precisely before being blended out and you can achieve that with the Smashbox Step By Step Contour Stick Trio. This set includes three pencils: a contour, bronze and highlight so you can precisely draw where you wish to contour your face. The set also includes a sharpener plus a step by step guide which gives instructions on where best to draw the pencils based on your face shape. I think it's a wonderful addition as every face shape is different and you can't always follow every tutorial you see online. Shade wise, I think all the shades are perfect for my skin tone and blend easily but I do think those with darker skin tones might find it too light for them. If you thought contouring was hard, give this a go and you'll see just how easy it is. If the pencil form doesn't sound like your thing, they also have the Smashbox Step By Step Contour Kit which is basically the same shades but in powder form. In this kit you get a mirrored palette with three shades: contour, bronze and highlight plus a brush and step by step guide on the packaging. I think this kit would be better if you're after a much softer look but compared to the pencils, I find the contour tutorials aren't as nearly as precise so beginners might find this one a little more difficult. Overall I think these kits are amazing, not only do they give you the correct colours to work with but the step by step guides make sure you're using the products to their full potential. I think there is a place for both kits but if I had to choose just one, I'd have to go for the Contour Stick Trio as I haven't seen any other brand with something similar. If I had any criticisms I'd say that I think these kits are more suited to light to medium skintones so I'd like to see something a little more appropriate for darker skin tones brought out too. Would you give these contour kits a try? Let us know in the comments below.